The Rangers striker will miss three games after being sent off against Aberdeen. Rangers striker Alfredo Morelos will be suspended for his side's Scottish Cup clash with Kilmarnock after failing to have a red card overturned at a disciplinary tribunal. The forward will also miss his side's next two league games against St Johnstone and Hamilton after the violent conduct charge was upheld. 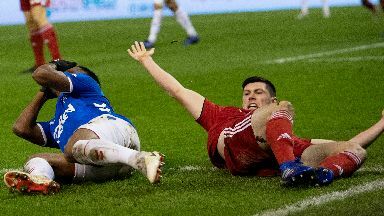 Morelos and Aberdeen defender Scott McKenna were involved in a running battle during the match which flared up after both went to ground in the second half. The pair appeared to kick out at each other and both were sent off by referee Bobby Madden. Rangers went on to win the match 4-2. Aberdeen did not appeal McKenna's dismissal and subsequent ban but Rangers lodged an appeal on Thursday and submitted the substance of their claim on Friday before an independent panel considered the case. The panel upheld referee Bobby Madden's original decision of violent conduct. Morelos serves a two-match ban but also has an additional game added on because it is not his first dismissal of the season. The extra game is to be served in the same competition as the red card was shown in, meaning he misses the Premiership match against Hamilton on February 24, regardless of any potential cup replay against Kilmarnock.